Hi loves! How are you today? Ready for the weekend? I am, relaxing tonight and tomorrow we'll be visiting my parents as they are celebrating their birthdays. So today I got 2 new shades from Brijit's Digits! If that sounds familiar, I already showed 2 of her polishes here. These shades are called Lavender Rose (which is a pinkish lavender, surprise surprise ;-)) and Show Your Nettle (a dusty jade). 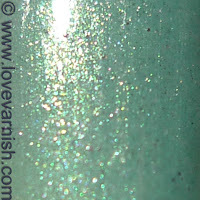 Brijit's Digits is 3 free and made with quality mica and glitters. A bottle holds 10ml. and prices range from $10,10 to $12,12. Both swatches are with Duri Rejuvacote as my base and Essence Better Than Gel Top Sealer for topcoat. Let's start with Lavender Rose! As I said it is a pinkish lavender and I thought the color was the same as OPI Lucky Lucky Lavender. It is in the same range but a bit lighter. 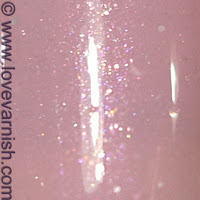 It contains a beautiful shimmer and sparkle and there seem to be some silver glitter or flakies too. 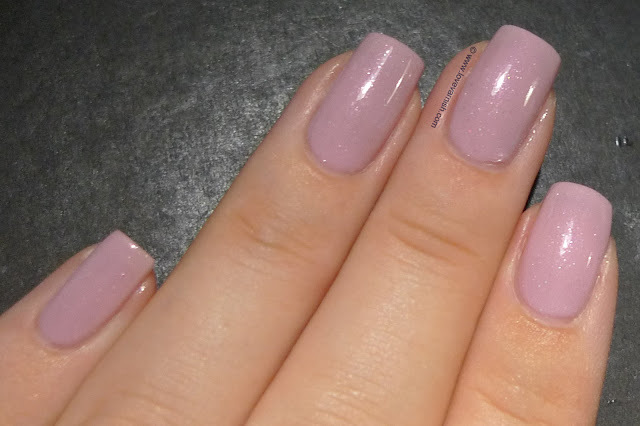 I used 3 coats for opacity, the 1st coat looked SO sheer I thought it'd never be opaque, but the second already added a lot of color and at 3 it had the right squishy touch to it. It dries smooth and with topcoat very shiny too. This feels very girly and I will be using this when Spring comes around I guess! Next is Show Your Nettle. I immediately liked this one in the bottle as I just love my dusty jade greens. 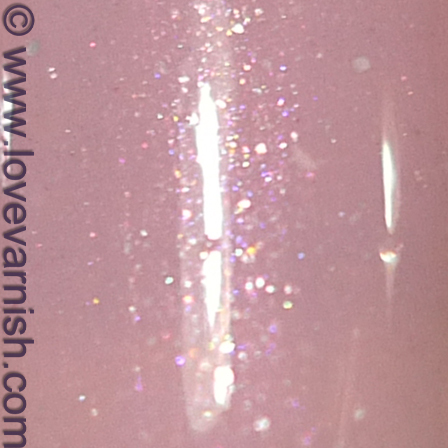 The shimmer is pretty strong with this one and there also seems to be a sparkle in there that just lights up the polish every now and then. Also there are little darker specks that give it a bit of a grey melange t-shirt vibe. For this I used 2 coats and the formula was a bit weird - the first few coats were nice and velvety but moving on it got a bit thick. I did paint this in front of a ventilator so it might be affected by it, also a little thinner will probably do the trick. The finish is a bit more textured, I think because of the darker specks. Topcoat does smooth it perfectly though! Which of these 2 shades would you pick? Tell me in the comments! Brijit's Digits can be found in Brijit's Etsy shop. You can also find information on Facebook, or check her on Twitter. Lavender Rose looks great on you! These are both so gorgeous. That green looks like a lighter version of Zoya Zuza. These are both beautiful! Great swatches girl! It is very soft and girly, but it has to suit you indeed :). It does look a bit like Zuza indeed, with that shimmer! Thanks Angie :). I am sure fairies wear polish ♥. Thanks for your comment! Thanks sweetheart! Hope you are having a great weekend too :). Lavender Rose is so pretty and delicate. I make it a rule not to buy any indies, but I may have to bend that rule just a little bit. Why do you try and not buy indies? Because of the hassle that is mostly involved with them? Just curious :). It would look amazing on you I think! Exactly that. I see all the drama and stress that arises when some indies do restocks, and it's all very unappealing to me. I'd rather not get worked up about a polish I can't even see in person before purchasing. I much prefer polishes that I can easily buy in-store. I try and avoid that, too. I'm in Europe so most of the times restocks happen when I am sleeping, and I will NOT sacrifice my precious sleeping time for polish, I just won't. Also, the prices sometimes asked for indies.. insane! I prefer companies I have easy communication with and that are reliable for me. Like Brijit's Digits! Ooh I love Show Your Nettle!